We’d love your help. Let us know what’s wrong with this preview of Hana Hashimoto, Sixth Violin by Chieri Uegaki. In this beautifully written picture book, Hana Hashimoto has signed up to play her violin at her school's talent show. The trouble is, she's only a beginner, and she's had only three lessons. Her brothers insist she isn't good enough. "It's a talent show, Hana," they tell her. "You'll be a disaster!" 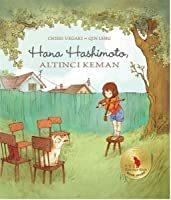 Hana remembers how wonderfully her talented grandfather, or Ojiichan, pla In this beautifully written picture book, Hana Hashimoto has signed up to play her violin at her school's talent show. The trouble is, she's only a beginner, and she's had only three lessons. Her brothers insist she isn't good enough. "It's a talent show, Hana," they tell her. "You'll be a disaster!" Hana remembers how wonderfully her talented grandfather, or Ojiichan, played his violin when she was visiting him in Japan. So, just like Ojiichan, Hana practices every day. She is determined to play her best. When Hana's confidence wavers on the night of the show, however, she begins to wonder if her brothers were right. But then Hana surprises everyone once it's her turn to perform --- even herself! To ask other readers questions about Hana Hashimoto, Sixth Violin, please sign up. Inspired by her grandfather’s violin-playing (and his former career as second violin in a symphony orchestra in Kyoto, Hana Hashimoto decides to not just learn to play the violin, but to perform in a talent show. A cool, little story about determination and love and music. I highly recommend this beautifully illustrated book of ambition, resilience and courage, told in a delightful story. Grandparents can be special people in the lives of young children and Hana’s is certainly inspirational for her. He is an accomplished violinist and plays for her and her brothers whilst they stay at his home. The author uses fantastic descriptions to help the reader imagine the feelings of the characters of this story - for example, when “Hana walked onto the stage . . . an ocea I highly recommend this beautifully illustrated book of ambition, resilience and courage, told in a delightful story. Grandparents can be special people in the lives of young children and Hana’s is certainly inspirational for her. He is an accomplished violinist and plays for her and her brothers whilst they stay at his home. The author uses fantastic descriptions to help the reader imagine the feelings of the characters of this story - for example, when “Hana walked onto the stage . . . an oceanic roar filled her ears.” Hana is a young girl who really wants to learn to play the violin after being inspired by her grandfather - or Ojiichan. She’s only had three lessons when she decides to enter a talent competition, despite derisory comments made by her brothers! She keeps practicing and, when the performance night arrives surprises everyone - you’ll have to read the story yourself to discover what she does! A beautiful book with a charming story. I could imagine reading this to both my grand daughters one aged 8 and the other aged 5. The story and illustrations will appeal across many ages. The delicate drawings, the subdued colours were all so sensitive to the narrative. I loved the unusual adjectives: walloping heart, oceanic roar, the feeling of happy sadness… to name a few. A charming little story and brilliantly illustrated. Thank you I enjoyed this book immensely. I award it 5 stars. I like this book, it is gentle and fun. This was a little too wordy for a picture book in my opinion, but that's my only real complaint. At first I was worried that Hana would bring across a magical performance after having only played a few days (that's how it would happen in Lego Friends or Strawberry Shortcake, ugh), but Uegaki's ending was much, much better. As a lifelong violinist, I can't help but notice when something is off pictures of violinists, especially in the way the instrument is held. This book is quite good; she's hold This was a little too wordy for a picture book in my opinion, but that's my only real complaint. At first I was worried that Hana would bring across a magical performance after having only played a few days (that's how it would happen in Lego Friends or Strawberry Shortcake, ugh), but Uegaki's ending was much, much better. As a lifelong violinist, I can't help but notice when something is off pictures of violinists, especially in the way the instrument is held. This book is quite good; she's holding the instrument and bow in the correct hands. The illustrator must have done her homework! There was one page where she carried the violin and bow in the wrong hands, but I'll give her the benefit of the doubt, because I've taught a lot of beginners and some of them take months to figure out a graceful way to carry their instrument. The best part: I loved the story of how Hana came to want to play the violin, with her grandfather. It was sweet without being saccharine. Hana has signed up to play her violin at the school talent show. But she has only had 3 lessons and her brothers are certain she will make a fool of herself. Each day, Hana practices and practices. She hopes to someday become as good at violin as her grandfather is. Finally, the day of the talent show arrives. Hana is nervous. Will she make a fool of herself? Her performance is definitely not what I was expecting. Hana shows that it takes hard work and persistence to develop a talent. She also sh Hana has signed up to play her violin at the school talent show. But she has only had 3 lessons and her brothers are certain she will make a fool of herself. Each day, Hana practices and practices. She hopes to someday become as good at violin as her grandfather is. Finally, the day of the talent show arrives. Hana is nervous. Will she make a fool of herself? Her performance is definitely not what I was expecting. I think this book is so sweet, and not just because I'm going to have to purchase this for my niece, the youngest girl with two older brothers, one of whom is named Kenji like in the book. ;) A story about learning an instrument and trying and succeeding in your own way, while also looking at those we love who came before, this story was sweet and touching. This is a sweet story about a young girl who is inspired to learn to play the violin by her grandfather. The illustrations, rendered in pencil and colored digitally, are simple and effectively help to tell the tale. As a former student of Oriental Studies and an avid defender of variety in books, particularly children's I couldn't miss the opportunity to read Chieri Uegaki's Hana Hashimoto, Sixth Violin. Hana is a brave girl, who after three violin lessons feels ready to sign up for the talent show even though her brothers mock her. Hana's parents seem more confident and Hana let's her grandfather's words and music inspire her as she shows the reader the value of practice and dedication. When I was little I w As a former student of Oriental Studies and an avid defender of variety in books, particularly children's I couldn't miss the opportunity to read Chieri Uegaki's Hana Hashimoto, Sixth Violin. When I was little I wanted to learn to play the violin, unfortunately I couldn't but that didn't stop me from pretending I could. Unlike Hana I didn't have a relative that played the violin but I let all the great musicians fill my house with their music and the strings have always been my favourite. However when Hana went to Japan to see her Ojiichan, he filed the house with music of his own making and she decided to learn to play like him. I think Hana's little adventure is a fantastic example of picking up something widely known and making it yours. It's about finding that thing that makes what you do yours and not just a copy of someone else's work. Even musicians need to find their tune and the same piece played by two different people doesn't sound quite the same and Hana shows us that she can make the strings in her violin hers and not just a copy of her Ojiichan. Also I think this was the first time I encountered a book who had both a musical theme and a foreigner character in the title. As I said at the begin of this review I support diversity in book and this means that I like to support authors that write about diverse characters. Chieri Uegaki's Hana Hashimoto is a fantastic example because we can see different cultures and have an Asian, more specifically a Japanese main character. It may sound like it isn't too much but in 2012 only 2% of children books had a main Asian Pacific American character. This puts Hana in a very select group and makes her even more special. If Hana wasn't special enough Qin Leng's illustrations would have helped her be. The pictures that fill this book are delicate and beautiful and a fantastic addiction to the story. The drawings of Ojiichan's house takes us to Japan while the ones of Hana's house reflect the western world. I loved the soft colours and the magical tone of the drawings. My favourite illustration was the one of Hana playing when she was in the stage of the talent show and we can see all the sounds leaving her violin. I also enjoyed seeing Ojiichan's house and Hana sleeping in a futon. I received a free ARC copy of this book by the book's publishers via NetGalley in exchange for an honest review. After listening to Ojiichan play the violin for her, Hana has her heart set on learning how to play the violin too. Just a few days after beginning to learn how to play the violin, Hana wants to enter the talent contest. She practices everywhere, in front of her brothers and her parents, even her dog, Jojo or an old picture of Ojiichan. Whilst performing alone, Hana can pretend she is I received a free ARC copy of this book by the book's publishers via NetGalley in exchange for an honest review. This was an absolutely beautiful book and one that shows despite others' comments and beliefs, you are capable of doing anything which you set your heart upon doing. Hana overcomes adversity and stands up to her brothers, proving that with just a bit of courage and confidence, anything is possible. A story that shows you should never let anyone say that you "can't do" something. Go and prove them wrong. Hana Hashimoto is one determined little girl when it comes to her violin lessons. After only three, she signs up for the school talent show causing her brothers to laugh hysterically and proclaim she will not bring her talent at all to the show, because she has none. Now, that's mean isn't it? Her grandfather, Ojiichan, was a professional violin player in Japan. He played beautifully for the siblings when they had gone to visit him last summer. Hana was so enamoured with his skill she decided th Hana Hashimoto is one determined little girl when it comes to her violin lessons. After only three, she signs up for the school talent show causing her brothers to laugh hysterically and proclaim she will not bring her talent at all to the show, because she has none. Now, that's mean isn't it? Her grandfather, Ojiichan, was a professional violin player in Japan. He played beautifully for the siblings when they had gone to visit him last summer. Hana was so enamoured with his skill she decided that she too would take up playing the violin and make melodious music too. He was so talented that he could play not only classical pieces, but also sounds imitating nature and even entertain fireflies, encouraging them to dance. She would practice diligently, perched on a chair before her faithful dog and a photo of her grandfather as her adoring audience. Can she succeed? Can she display her familial talent before the whole school? You will be surprised what one little ambitious, and strongly motivated girl can accomplish if she sets her mind to it. Leng's charming illustrations draw the reader in. The vignettes are drawn with pencil and digitally coloured in with lots of detail that are pleasing to the eye. I love how she portrayed Hana, worrying and waiting to take her turn on a huge stage...waiting with "a walloping heart." This gem of a book will resonate with kids who experience those pre-performance jitters and give hope to those who are willing to step forward, with courage, and display their talents before an audience whether it be big or small. I am sure you will enjoy this book as much as I did. Hana Hashimoto is a little girl who, inspired by her grandfather, is learning how to play violin. Just after attending three lessons, she is determined to enter a talent show and play in front of a crowd. This idea of hers is discredited by her two older brothers who think that she is still too inexperienced with the violin. However, despite this lack of encouragement, Hana perseveres and keeps on training her skills, always keeping in mind how listening to her Ojiichan play made her feel. There Hana Hashimoto is a little girl who, inspired by her grandfather, is learning how to play violin. Just after attending three lessons, she is determined to enter a talent show and play in front of a crowd. This idea of hers is discredited by her two older brothers who think that she is still too inexperienced with the violin. However, despite this lack of encouragement, Hana perseveres and keeps on training her skills, always keeping in mind how listening to her Ojiichan play made her feel. There were a lot of aspects that I absolutely loved about this book. It’s written and illustrated by two females, and beautifully so. Both the story and the illustrations are complementary and they draw the reader into the story. Also, the fact that the characters are from Asian descent really caught my eye, because I believe a lot more representation of cultures other than the western is needed. Having a children’s book, published in US and Canada, that is inclusive and representative of a culture other than the “predominant” can only be object of appraisal. Other than that, the themes portrayed in the story are also very positive and great messages are transmitted to the reader. This is the story of a young girl who fights disbelief (or the lack of encouragement of significant others) and perseveres to achieve her goal, who honors family memories, and who overcomes her fears and anxieties in order to face other people. 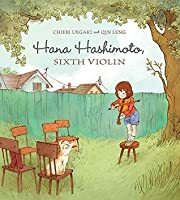 Hana Hashimoto, Sixth Violin is a short and really pleasant read and I’m sure both parents and kids will love the book. Absolutely recommended. Reviewed from a digital ARC provided by Netgalley. With absolutely gorgeous lyrical language, Chieri Uegaki tells the story of a little girl learning to play the violin in her own special way. Hana has only had three violin lessons when she decides to enter the school talent show. Her brothers laugh at her, but she recalls the beautiful notes played by her Ojiisan (grandfather) when she visited Japan and longs to play like him. Every day she practices, playing for her parents, her dog, even a pi Reviewed from a digital ARC provided by Netgalley. With absolutely gorgeous lyrical language, Chieri Uegaki tells the story of a little girl learning to play the violin in her own special way. Hana has only had three violin lessons when she decides to enter the school talent show. Her brothers laugh at her, but she recalls the beautiful notes played by her Ojiisan (grandfather) when she visited Japan and longs to play like him. Every day she practices, playing for her parents, her dog, even a picture of her Ojiisan. When it is her turn to play in the talent show, Hana is nervous and thinks maybe her brothers were right, but she bravely perseveres, playing a selection of sounds she has heard around her - from a crow calling her babies to raindrops falling on paper umbrellas. The ending is quiet and lovely, showing children that even if they are just starting something new, it is important to practice and do your best (“gambarunoyo” in Japanese). "Ojiichan played every morning. From his study, the clear, bright notes would drift upstairs, through the shoji screen doors to where Hana slept on sweet-smelling tatmi mats, and coax her awake as gently as sunshine." Hana's grandfather plays classical music, folk songs, and melodies inspired by nature. But Hana has only had three lessons, and her big brothers tell her that her performance at the school talent show is sure to be a disaster! In sprightly ink and watercolor art, we see Hana practic "Ojiichan played every morning. From his study, the clear, bright notes would drift upstairs, through the shoji screen doors to where Hana slept on sweet-smelling tatmi mats, and coax her awake as gently as sunshine." Hana's grandfather plays classical music, folk songs, and melodies inspired by nature. But Hana has only had three lessons, and her big brothers tell her that her performance at the school talent show is sure to be a disaster! In sprightly ink and watercolor art, we see Hana practice for her parents, for the dog, and in front of a photo of Ojiichan, until, with consummate courage, she takes the stage. Reviewed for the Baltimore Sun, March 2015. Grandparents are special people. We seldom forget the relationship and bond we share with our Grandparents. Hana is no different. She remembers her Grandpa in Japan. She has special memories of him entertaining her with his music. Grandpa played in an Orchestra and he was very good. He also liked to make fun sounds with his music. Hana decides to play the violin for the school talent show. Her brothers think this is hilarious and are sure she is going to flop. However, Hana has something in mind and she is going to prove them wrong. 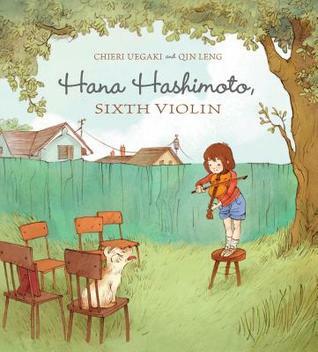 Hana Hashimoto, Sixth Violin is an endearing tale of love, strength and determination. The illustrations are very cute and bring this beautiful story to life. Job well done!! I seriously admire Hana, the young protagonist of this book. She has only had 3 violin lessons with her grandfather, and she is ready to demonstrate her skill at a school talent show! Her brothers are her personal Statler and Waldorf who tell her that she doesn't have the titular talent, and neither does she know what she's doing it all... and Hana isn't exactly confident herself. But what she produces on stage is something quite interesting. It's such a pretty book, with illustrations that perfe I seriously admire Hana, the young protagonist of this book. She has only had 3 violin lessons with her grandfather, and she is ready to demonstrate her skill at a school talent show! Her brothers are her personal Statler and Waldorf who tell her that she doesn't have the titular talent, and neither does she know what she's doing it all... and Hana isn't exactly confident herself. But what she produces on stage is something quite interesting. It’s a beautiful, loving story of the memories of a grandfather who is an accomplished violinist, who played for her when she visited him, the classics, but also beautifully imagined pieces like “a crow cawing for her seven chicks” and “the sound of raindrops on the oil-paper umbrella Hana twirled under during summer storms.” When Hana, a beginner, decides to play for the school’s talent show, her brothers think she’s foolish, but what happens on stage is a sweet surprise to everyone. I really enjoyed this tale of Hana and her violin. Hana has only begun to play her violin and she's performing at her school's talent show soon. Her brothers tease her beginner-level skills, but she's determined to do well. Thanks to the memories of her grandfather and his extraordinary playing, Hana is inspired during her performance. The unexpected-yet-happy ending is pitch perfect for this story. This book made me smile so much. Hana has started taking violin lessons after spending time with her grandfather in Japan who plays. Now she feels she is ready to be in a talent show. Her brothers are not so sure since she has only had three lessons. She has a surprise for them though as she practices sound effects with her violin and shows them off. This is a wonderful book to use with primary children particularly in a music class. Loved this book! Would recommend it to any child who has ever been told that they "couldn't" do something. This book is beautifully written, especially the parts that show the impact that her grandfather had on her through his own violin playing and especially his belief in and encouragement of her becoming a violinist. Inspired by her grandfather, a professional violinist, Hana sings up to perform at the school talent even though she's had only a few lessons. A wonderful story that will especially resonate with readers who suffered stage fright. Beautiful story of persistence and working hard for something you want to do. To me, knowledge is all about connecting different pieces of information together to form a web that can uphold your arguments and beliefs. Therefore, connecting new knowledge or texts to outside things is very, very important. Text-to-world connection: this type of connection is perhaps the hardest to pin down, but it’s like a larger version of the text-to-text connection, except that we are now connecting it to the news story we heard on the radio yesterday, the woman in the grocery store that we saw this morning, or something that we know about another country or topic. I see this type of connection as a way to apply the knowledge gained in the new piece of literature to a real problem or situation on a larger scale. I also noticed a couple more things from the book that I thought were clever. I know a lot about Japanese culture from my martial arts studies in Judo, but also from reading manga and watching anime. Therefore, I thought it was cool that authors Chieri Uegaki and Qin Leng chose to include the Romaji (Japanese words spelled phonetically using our Roman alphabet) for grandfather. To some, “Ojiichan” may have been interpreted as the grandfather’s name, but I understood it as the word for grandfather, followed by the -chan honorific, which signifies cuteness or closeness to the subject. In fact, Ojiichan himself uses it for Hana later on, when she “sees” him before her performance. I used this prior knowledge to connect Hana Hashimoto, Sixth Violin to my world. Hanna Hashimoto is about a little girl named Hana who tells her friends and family that she will be preforming the violin in her next school’s talent show. After announcing her plans, her brother immediately makes fun of her, and tries to discourage her from participating because is a beginner at playing the violin. This story captures the reminiscing of Hana and her memories of the time she first fell in love with the violin, in Japan with her Grandpa. Her grandpa Ojiichan who was once about of Hanna Hashimoto is about a little girl named Hana who tells her friends and family that she will be preforming the violin in her next school’s talent show. After announcing her plans, her brother immediately makes fun of her, and tries to discourage her from participating because is a beginner at playing the violin. This story captures the reminiscing of Hana and her memories of the time she first fell in love with the violin, in Japan with her Grandpa. Her grandpa Ojiichan who was once about of a great sympathy orchestra. Hana’s grandpa was so good that he performed in front of the imperial family. Her memories of her grandpa playing the violin everyday as lullabies, and composing melodies that made the fireflies dance, began the fascination for the violin. When Hana came back home to her parents she began to take violin lessons and just like her Ojiichan, practiced playing every day. The time came for her talent show, Hana became nervous but remembered that her grandfather was cheering her on, and she began to show the audience how she plays the violin. Hana Hashimoto announces that she will be playing the violin for the school talent show, and her brothers laugh so hard they almost fall out of a tree. Hana had recently spent the summer with her grandfather Ojiichan in Japan, and he played the violin every wakening second that he could. Hana enjoyed listening to her grandfather play the violin, especially when he played little tunes like the chirp of a cricket, and the how he could mimic the raindrops on an oil-paper umbrella. Hana enjoyed this Hana Hashimoto announces that she will be playing the violin for the school talent show, and her brothers laugh so hard they almost fall out of a tree. Hana had recently spent the summer with her grandfather Ojiichan in Japan, and he played the violin every wakening second that he could. Hana enjoyed listening to her grandfather play the violin, especially when he played little tunes like the chirp of a cricket, and the how he could mimic the raindrops on an oil-paper umbrella. Hana enjoyed this so much that it gave her the motivation to learn to play the violin when she got home. Just like her grandfather, Hana had been practicing playing the violin every chance she got. When it came time for her to go on stage at the big talent show, she got very nervous and thought maybe her brothers were right to laugh at her for being in the talent show. She then took a big breath in, and pretended her grandfather was in the audience. She played the sounds of rain on a paper umbrella, and the sounds of her neighbor’s cat at night. Everyone seemed to be pleased and laughed at the sounds she was making. Hana was very pleased with herself, as was her family. This is a very well-written and sweet book written by Chieri Uegaki. Hana Hashimoto, Sixth Violin is written by Chieri Uegaki is about a young girl who wants to learn how to play the violin for her school talent show. She was inspired by her grandfather who would play every morning which Hana loved to hear. Her grandfather was an amazing violinist who Hana looked up too. Hana’s two brother do not think that she will be able to learn by the time her talent show came around. She was determined to prove them wrong and practiced every day. This story is great for stu Hana Hashimoto, Sixth Violin is written by Chieri Uegaki is about a young girl who wants to learn how to play the violin for her school talent show. She was inspired by her grandfather who would play every morning which Hana loved to hear. Her grandfather was an amazing violinist who Hana looked up too. Hana’s two brother do not think that she will be able to learn by the time her talent show came around. She was determined to prove them wrong and practiced every day. This story is great for students to read for inspiration and determination showing that with effort and the right mind set anything is achievable. One strength of this book was inclusion of Japanese culture. It included language with Japanese sayings and commodities that their culture values; these are paper umbrellas, shoji screens and a tatami mat. This would be a great way to introduce students to different cultures and explain the differences. One small critique is that I would have liked to see more emotion in the illustrations. Even though the pictures do go along with the plot it would be more interesting to see the sadness when her brother would tease her. Even when their family was proud and she was playing again for her family to see the smiles and pride in their faces. Chieri attended Sir John Franklin Elementary School. Initially, she had to take English as a Second Language classes as she spoke mostly Japanese at home. An excellent ESL teacher and an inherited Chieri Uegaki is a second-generation Japanese-Canadian who was born in Quesnel, British Columbia. By the age of one, she and her parents had moved to East Vancouver, where she and her two sisters grew up.